EW ORLEANS, La. 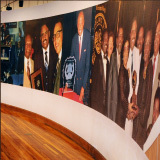 (November 25, 2006) – The national fundraising campaign for the Eddie G. Robinson Museum kicked off on Saturday, November 25, in conjunction with the festivities surrounding the 33rd Annual Bayou Classic. The official kickoff announcement was made during the Louisiana Legislative Black Caucus’ Jazz Brunch and included a keynote address from Louisiana governor Kathleen Blanco. Other state dignitaries that spoke during the event included Louisiana Secretary of State Jay Dardenne, whose office oversees the operations of all state museums, and State Representative Richard Gallot. Others in attendance at the event were John Belton, Chairman of the Eddie G. Robinson Museum Commission, Shreveport Mayor Cedric Glover, Monroe Mayor Jamie Mayo, Louisiana Commissioner of Agriculture Bob Odom, Louisiana Speaker of the House Joe Salter, State Representative Karen Carter, representatives of the Robinson family, members of the Eddie G. Robinson Museum Commission, and members of the Friends of the Eddie G. Robinson Museum Commission. “We are extremely excited to officially begin our fundraising efforts,” said Belton. “This has been a long time coming and we are very eager to finally begin the process of raising money for what will ultimately be a world-class landmark that will honor the unmatched legacy of Coach Robinson, a true American icon.” The fundraising initiative, spearheaded by The Team, will allow people from all over the world to financially contribute to the museum in a number of ways. Those wishing to contribute using a major credit or debit card may call 1-866-WINS-408 or log on to www.robinsonmuseum.com and donate online. Contributors may also mail a donation to the Friends of the Eddie G. Robinson Museum at P.O. Box 550 Grambling, LA 71245. All contributions go to the Friends of the Eddie G. Robinson Museum and are tax deductible. “We are truly grateful to the Louisiana Legislative Black Caucus for partnering with us in our announcement event,” said Wilbert Ellis, Chairman of the Friends of the Eddie G. Robinson Museum Commission. “They have been great partners in this initiative and we are very excited about continuing to work with Caucus members throughout this process.” In addition to the announcement event, The Team: Sports, Entertainment, & Media has produced a public service announcement promoting the museum and the fundraising efforts. The PSAs began running during NBC’s broadcast of the Bayou Classic and will continue to run nationally throughout the college football bowl season. The PSAs feature well-known sports figures such as Super Bowl XXII MVP and former Grambling State University quarterback and head coach Doug Williams, legendary Penn State University head coach Joe Paterno, American Football Coaches Association Executive Director Grant Teaff, and NBA legend Charles Barkley. “Eddie Robinson to me is the greatest, kindest, most caring, and most loving husband and father ever,” said Doris Robinson, Coach Robinson’s wife of 65 years. “His successes have filled him with pride and humility. When able, he has always been ready to serve his church, Grambling State University, and the community. He is a champion of all causes that he considers just. He believes in God and in his family and had extraordinary devotion to his job.” The Eddie G. Robinson Museum will be located on the campus of Grambling State University where Coach Robinson achieved legendary status by becoming NCAA Division I college football’s all-time winningest coach. Coach Robinson won 408 games at Grambling during a 57-year coaching career that stretched from 1941-1997 and is the namesake of the Football Writers Association of America’s National Coach of the Year Award. During his illustrious career, Coach Robinson won nine Black College National Championships and 17 Southwestern Athletic Conference championships. 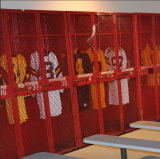 The College Football Hall of Fame inductee graduated over 80% of his players and saw more than 200 of his athletes play in the NFL, including four who are now enshrined in the Pro Football Hall of Fame. The fundraising campaign has a goal of raising $5 million for the creation of the museum, its exhibits, and ongoing museum operations and programs.